ONLF has today disarmed 1,740 of its armed members in a ceremony held in Jigjiga. Last edited by info on 08 Feb 2019, 19:30, edited 1 time in total. Re: ONLF has today disarmed 1,740 of its armed members in a ceremony held in Jigjiga. photo: Haile Selassie Gugsa, a Tigrayan & son-in-law of Emperor Haile Selassie, was a top collaborator with Mussolini's invading army of Ethiopia. 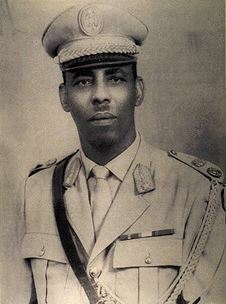 photo: a Somali 'askari' or army officer in the Italian Somalia named Siad Barre (later the dictator of Somalia) also guided & helped Mussolini's Italian army in opening a second front from Italian Somalia to invade Ethiopia from the south & east. See map showing how Ethiopia was invaded from Tigray/Eritrea & Somalia. Also, here is a photo showing young Siad Barre as member of the Italian 'carabineri' [army/police] in Moqadisho, Somalia just before the Italians invaded Abyssinia/Ethiopia in 1935. [back row, a third from right]. map: Mussolini's armada invaded Abyssinia/Ethiopia from two fronts: a) from Eritrea/Tigray &, b) from Mogadishu, Somalia.